Stewart Downing says Middlesbrough will enter the Championship play-offs full of confidence as they prepare to take on one of his former sides. A 2-2 draw at Ipswich on the final day of the season sealed a 5th place finish for Boro and set up a play-off semi-final clash with Aston Villa. And Downing is relishing the chance to take on his former employers and knows that the Teessiders will be up for the battle. The winger made his 500th league appearance during the draw at Portman Road, and marked the occasion with Boro’s first goal to level the scores after Freddie Sears had opened the scoring for the hosts. Martyn Waghorn’s penalty then looked to have handed Ipswich victory, before Patrick Bamford netted deep into injury to secure a point for Tony Pulis’ side. And despite leaving it late, Downing was always confident that his side would find a leveller. “Even late on I thought we’d get a goal when we were one down,” he told the club’s official website. 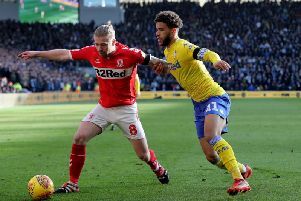 Bamford’s strike meant that Boro were paired with Villa in the play-offs in a tie which will see Downing return to the club where he made 82 appearances between 2009 and 2011. It was a clash that the winger felt was coming, and he claims his current side will enter the two legs full of confidence as they seek an immediate return to the top flight. “It’s a good tie,” he admitted. “I had a feeling we’d get them (Aston Villa) with the results and I thought we’d get a result today. “It’s a big game, it’s what it’s all about and I’m really looking forward to it. “It’s who fancies it on the day and we’re going into it with confidence.